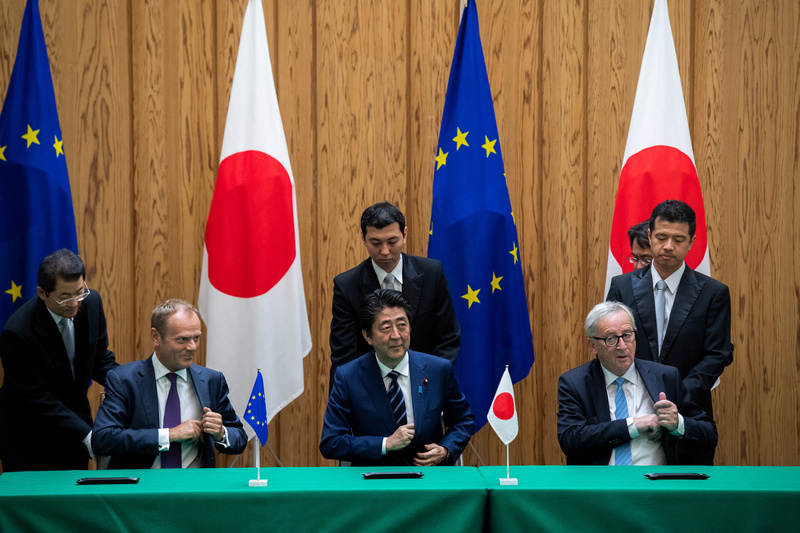 BRUSSELS, Nov 5 (Reuters) - European Union and Japanese plans to form the world’s largest free trade area cleared a significant hurdle on Monday when EU lawmakers specialising in trade backed a deal that could enter force next year. Both have faced trade tensions with Washington and remain subject to U.S. tariffs imposed by President Donald Trump on imports of steel and aluminium. Japan had been part of the 12-nation Trans-Pacific Partnership that Trump rejected on his first day in office, turning Tokyo’s focus to other potential partners - such as the European Union. The EU-Japan agreement will remove EU tariffs of 10 percent on Japanese cars and 3 percent for most car parts. It would also scrap Japanese duties of some 30 percent on EU cheese and 15 percent on wines and open access to public tenders in Japan. Critics say the EU-Japan agreement will give too much power to multinationals and could undermine environmental and labour standards, the latter because they say Japanese employees face tougher conditions and less adequate union representation. Belgium’s regions have though given their backing.